MAIDUGURI—Angry youths, members of a vigilante group, lynched a policeman and threatened others, Saturday, in retaliation for the killing of one of their members in Borno State Nigeria, causing further friction in an area tense with violence from Islamist militants. The Civilian Joint Task Force was formed by residents to help capture Boko Haram suspects in and around Maiduguri. 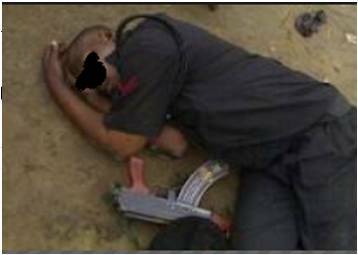 Spokesman of the 7 Division of the Nigeria Army, Lt. Col. Sagir Musa, said he took the attacked policeman, who was drenched in blood, to the police headquarters. It was not immediately clear if the attacked policeman was the same officer that shot dead the vigilante member. State Police Commissioner, Mr. Lawal Tanko, confirmed the incidents and the death of the policeman. The angry vigilantes also blocked the major Kano-Maiduguri Road, burning tires and threatened the police, calling them accomplices of Boko Haram. A Civilian-JTF member, Muhammed Adamu, said that members of his group were stopped by policemen for driving in the wrong lane and they explained that they had caught a Boko Haram member. Adamu said: “We told him we could not (take the other lane) because we had a Boko Haram suspect. He threatened to shoot if we didn’t. Governor Kashim Shettima of Borno State pleaded for calm on Saturday. He said the government would try to pacify and compensate the family of the dead Civilian-JTF member. He said: “This is a sad development as it really threatens the emerging peace we are enjoying. I want to appeal to the angry youths to calm down. Lt. Col. Musa said the military had been deployed to the area, adding that the 7 Division, once fully formed, will replace the vigilantes in the fight against Boko Haram.